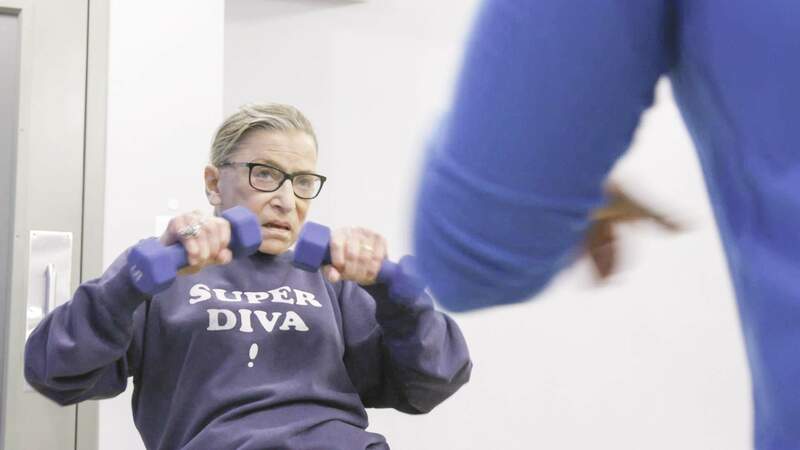 It's hard to pick just which moment is more endearing: seeing US Supreme Court Justice Ruth Bader Ginsburg lifting weights in the gym wearing a 'super diva!' jumper, or seeing women six decades her junior plaster her glasses-rimmed face across their t-shirts, bags and even skin. Actually, RBG is filled with scenes that top both. Whenever the octogenarian is spied doing what she does best — fighting for women's rights and progressive ideals, first as a lawyer and then as a judge — this documentary lights up. Still, if there's anything that beats just simply witnessing Ginsburg in action, it's watching as she howls with laughter after seeing Kate McKinnon's Saturday Night Live impersonation of her for the first time. That's the kind of film that RBG is — jam-packed with segments that equally inform and entertain, well aware of what Ginsburg stands for, and unashamedly celebratory about her impact and achievements. Co-directors Julie Cohen and Betsy West had each separately interviewed the justice previously, and felt that the time was right for a documentary paying tribute to her life's work. They couldn't have been more accurate, astute or ahead of the curve. Consider the end result not just an ode to an American icon, but a reminder that change is possible, that battling for it is worthwhile, and that both remain the case in today's fraught and fractured US political climate. If you've missed the Notorious RBG memes, the aforementioned SNL skits, and both the praise and vitriol slung Ginsburg's way (including some of the latter from America's tweeter-in-chief), don't worry. RBG fills in the gaps, and doesn't assume that viewers have an intricate knowledge of the US judicial system or the movie's central figure. Rather, it tackles Ginsburg's tale from two angles. As a birth-to-present day chronicle, the film steps through her childhood and her opposites-attract college romance with husband Marty, as well as her determination to juggle law school with motherhood and everything that has come since. As an exploration of her specific legal influence, it delves into several cases in detail, focusing on those that she argued in front of the Supreme Court prior to joining its ranks. Ginsburg's biography, her legal contribution and each of the individual cases featured could easily furnish their own documentaries, but Cohen and West know how to balance these various components. More than that, they know how to insert Ginsburg's personality into the film, and shape it with her drive and spirit. Given that the justice is known for being reserved and serious (when she's not living her lifelong dream of starring in an opera), that might sound easier said than done. But there's humour, heart and a big helping of grit to this highly accessible movie, even when it's largely assembled through talking heads, archival footage and snippets of Ginsburg's recent speaking appearances. Indeed, RBG mimics its eponymous figure in several ways. Like the justice, it's small, smart and striving; thorough and proficient; and eager to make the world a better place than it currently is. The documentary is also a testament to something that isn't always championed quite so enthusiastically: simply working hard, getting things done and not worrying about any fanfare. With the #MeToo movement and the current recognition that gender equality is in a much worse state than it should be, the film couldn't come at a better moment, but capitalising upon the present mood is purely a stroke of good fortune. While Cohen and West knew Ginsburg was gaining a cult following when they first conceived of their project five years ago, they couldn't foresee they world they'd release their film into. Doing what's necessary and right just because there's a need for it — well, that couldn't be a more Ginsburg-esque move.